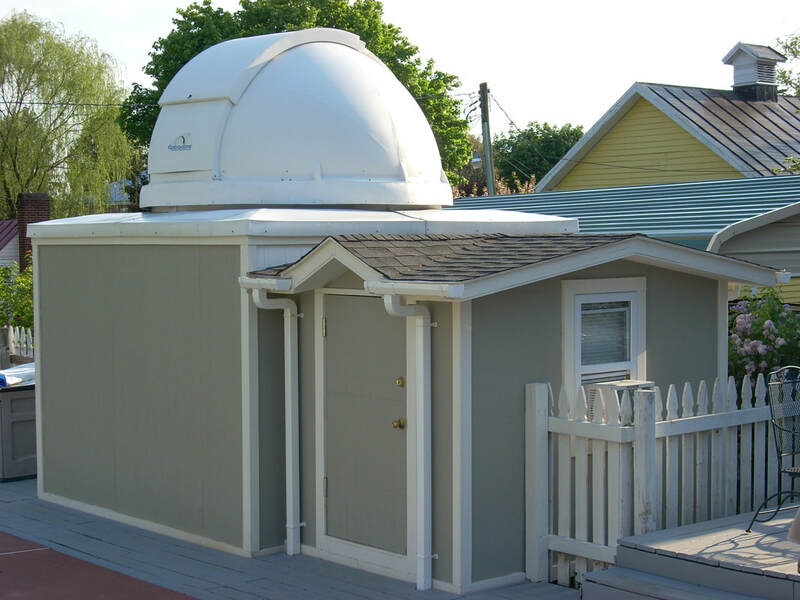 The Explordome was my observatory for 8 years when I lived in Luray, VA and was taken down in October 2017. ​The Exploradome went up in 2009 and now it's 2017 and we have a contract to sell our house, so it's coming down since the buyer does not want it. In the photo the dome has been removed and replaced with a shingled roof. 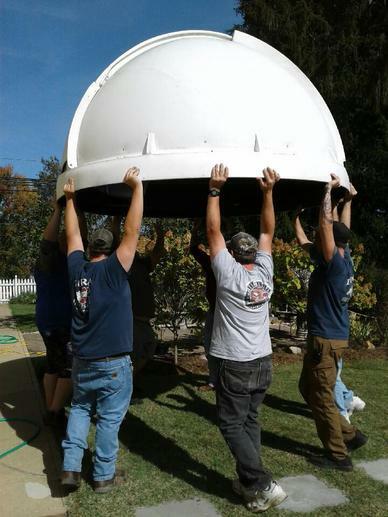 The dome is headed to storage in a friend's barn until I either sell it or reuse it at the new site. The main dome at the new observatory will be the 12' metal Lancaster dome and I'm not sure if I want the added workload of maintaining a second dome. But it would make a nice home for my 6" Kepler refractor. Preparing to lift the dome over some shrubs on the way to the trailer. Thankfully lots of help showed up, including several guys from the local VFD. 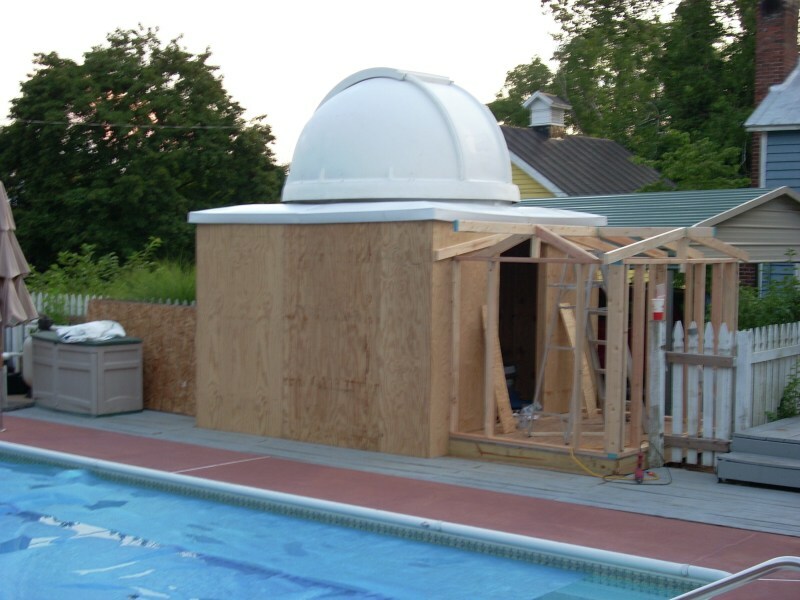 Construction began on the observatory in August 2009. It took about one month of full time work to complete. I purchased the 8' Exploradome with the pre-made dome ring and the roof transition panels. I also had Exploradome predrill the dome for the wheel track to preclude any possibility of an error on my part drilling holes in my beautiful new dome. The larger room is 10-foot square and built according to the plans provided on the Exploradome website, except the walls are taller than in the plans. The original wall height allowed for a 39" tall door. I didn't want to crawl in and out of the obs so I raised the wall height to 6 feet. I would liked to have gone even higher but I was afraid the pier for the telescope was getting too tall to be stable. With 6' tall walls the concrete pier stands 82" high and tips the scales at over 2300-lbs including the base. To compensate for the taller walls and pier I added a false floor in the obs, with steps up from the main floor, to bring me back to the desired pier height of 50". 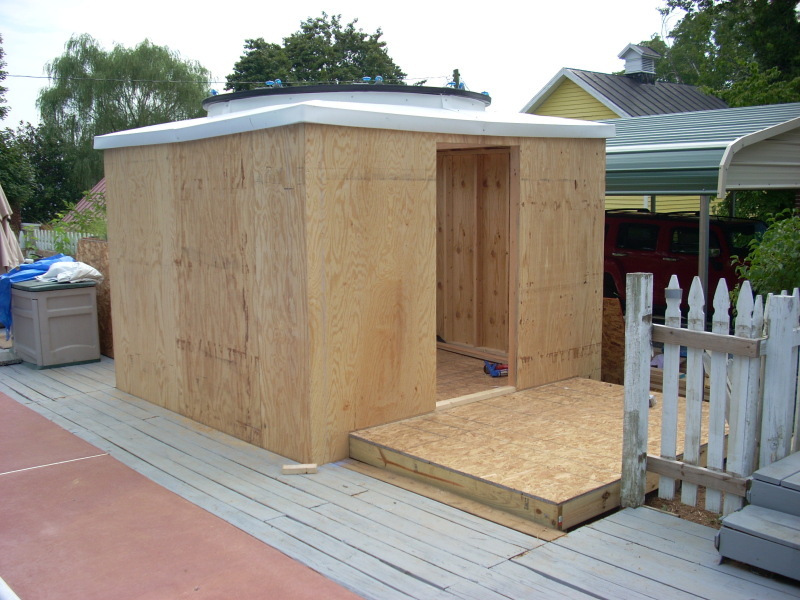 I also added a small 6' x 8' warm room to the side of the main obs. The overall size was dictated by building codes - staying under 150 sq. ft. avoided needing a building permit. The ceiling in the warm room is just under 6' tall because of the 6' walls of the main obs room and in the end I managed about a 5' high entry door with a step up from outside which brings the actual door height close to 6'. At 6' 5" I still have to duck a little to enter but at least I don't have to crawl. 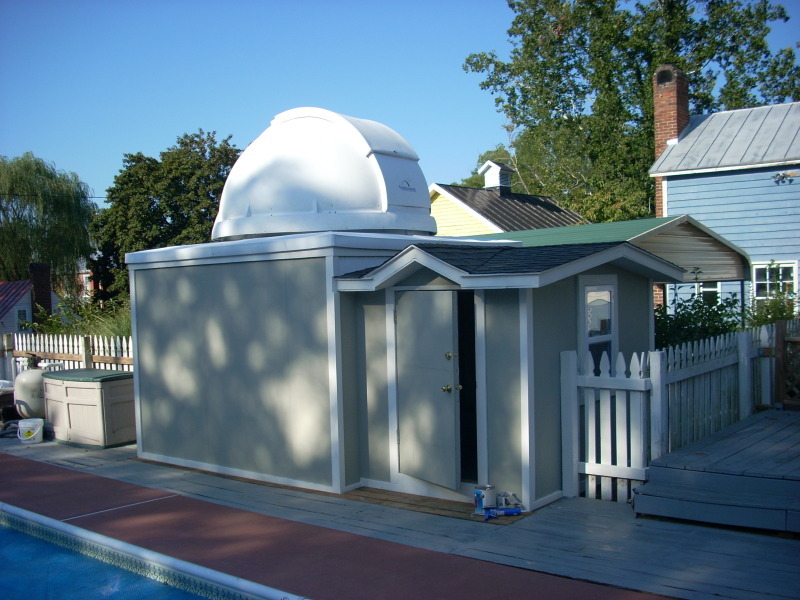 The Exploradome is a great product and made it possible for me to realize my dream of having a permanent observatory right in my own backyard. 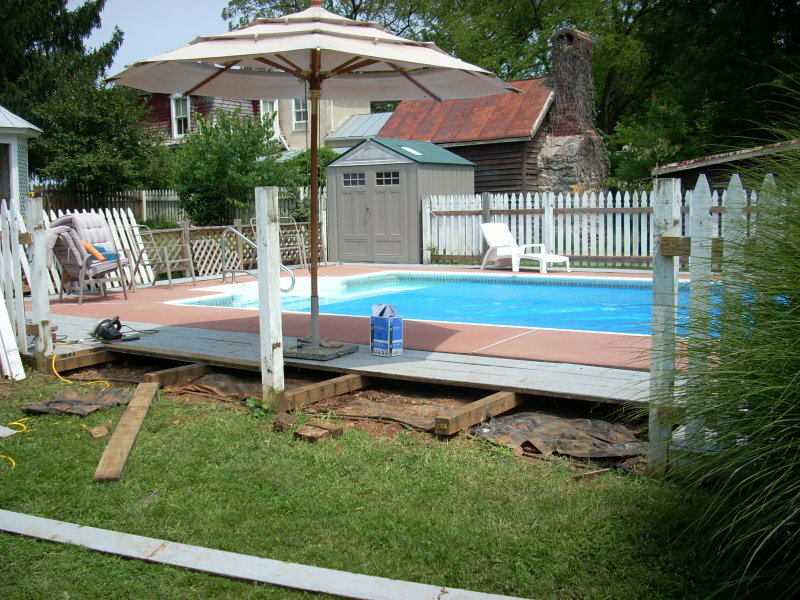 The obs is built into the side of my swimming pool deck so I began by removing part of the fence and deck. 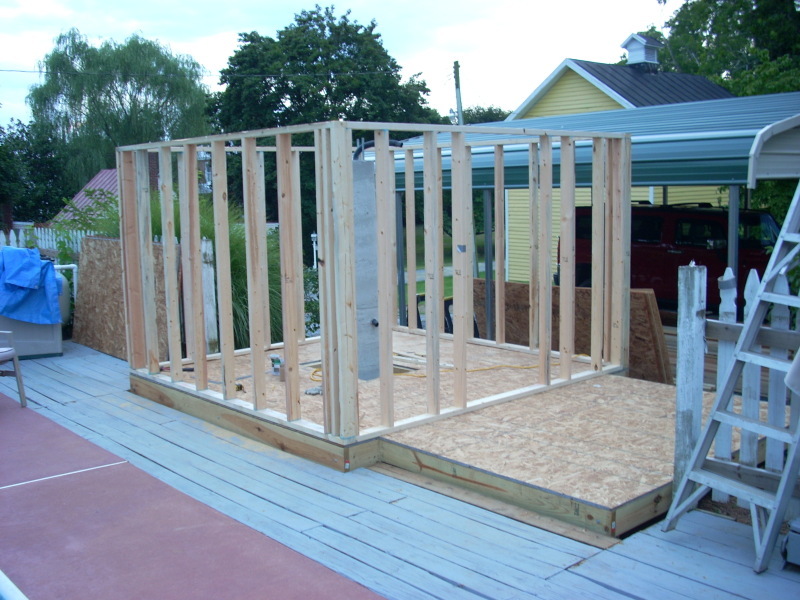 Framing in the observatory and warm room to measure where to locate the pier. 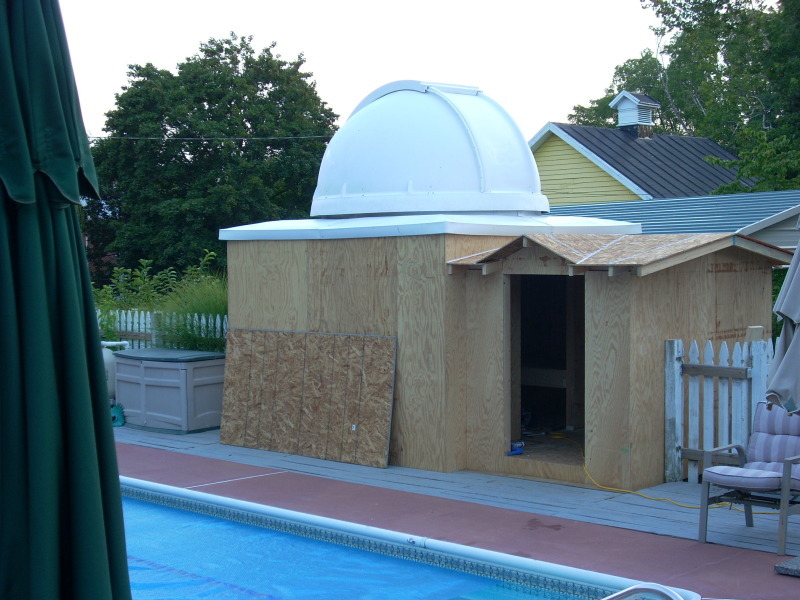 The observatory section framed. The walls are 72 inches tall. 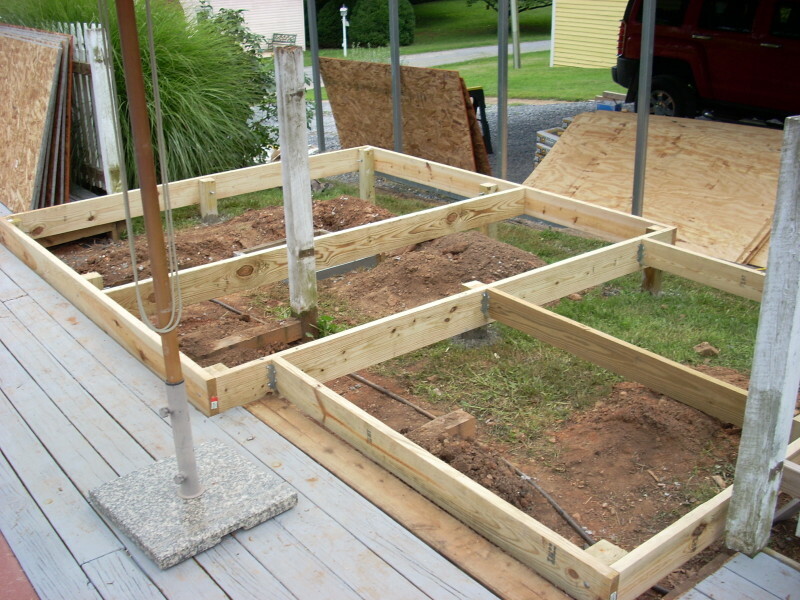 I pre-assembled the wall sections on the ground and then attached them in place. A higher view of the dome mounting ring and wheels installed and the roof transition panels. Installing the raised floor in the observatory section. The final pier height is 50 inches. 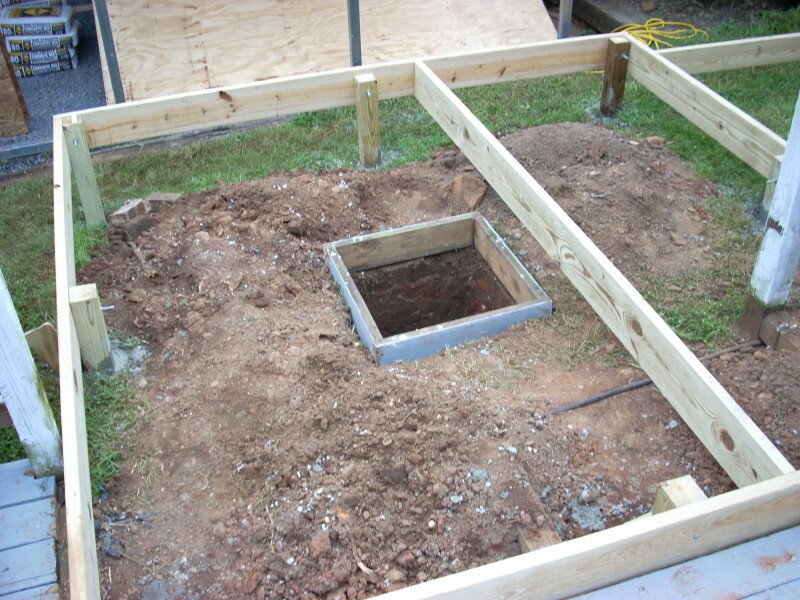 The trap door open to use the steps. Also note the sliding door between the obs and the warm room. Some of the building materials for the observatory. That's only about half the amount of cement needed. The hole for the pier is 2-foot square and 3-feet deep. 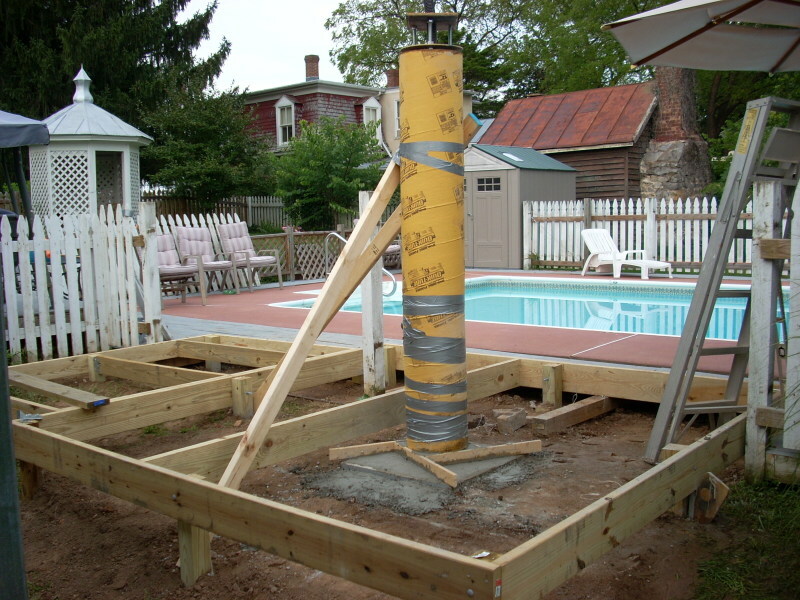 The pier poured. It is 82 inches tall. I poured this all in one day and the lower cardboard form got a bit waterlogged, hence the duct tape. Ready for walls. 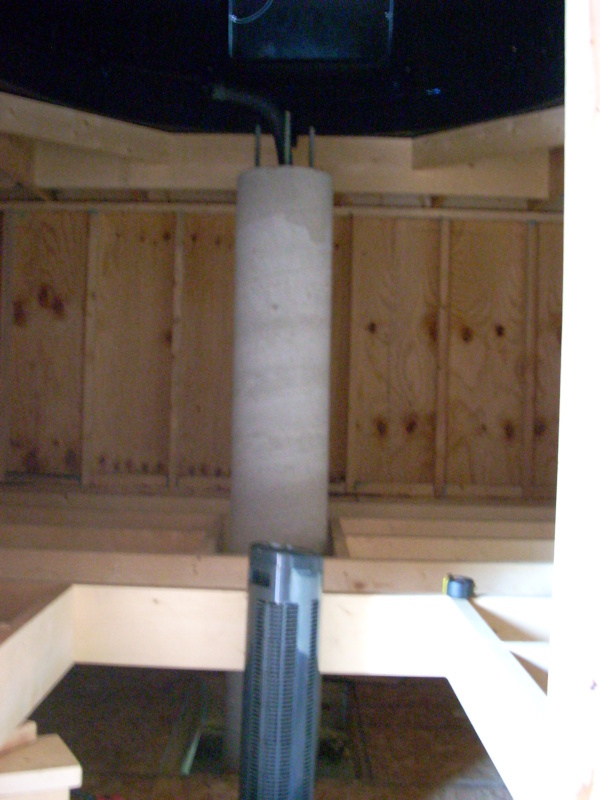 The black pipe in the pier is for running cables from under the obs floor to the mount. Four people lifted the dome into place. Weather tight and ready to be trimmed and painted. I made the door out of leftovers. A view of the steps up to the obs floor. The steps are free-standing and can be slid to the side to access the under floor storage. The trap door closed. With the sliding door rolled shut there is no danger of falling down the steps in the dark.